Aberdour Castle is built on the southern coast of Fife, on a defensive site protected by, and overlooking, the Dour burn with good views over the Firth of Forth. The castle contains features from many phases of occupation, the oldest being the 14th century rhomboid tower to the north. It was occupied up to the 18th century. The lands of Aberdour were held by the Vipont family, and passed to the Mortimers with marriage in the first half of the 12th century, but subsequent history is lost up until the grant by Robert the Bruce to Thomas Randolph, Earl of Moray in 1325. Randolph’s grandson then granted it to Sir William Douglas of Liddesdale in 1342. Douglas in his turn granted Aberdour to his nephew James Douglas of Dalkeith, but it is recorded that he kept the castle for himself until his death two years later. It is likely, therefore, that the rhomboid tower was erected by the Douglases. In 1386 Aberdour was made part of the Barony of Dalkeith, and remained a property of the Douglases of Dalkeith, later Earls of Morton, until 1725, by which time it had been partially destroyed in the first Jacobite Rising. 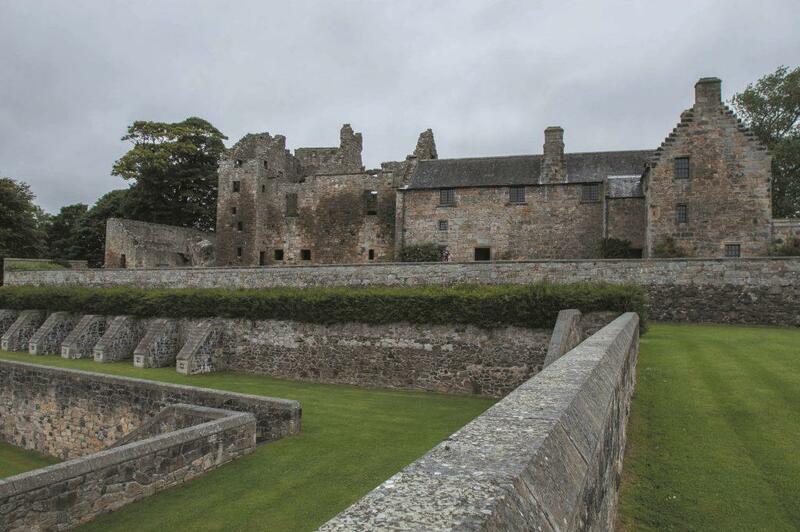 Aberdour Castle is arranged within a 16th century courtyard. The rhomboid tower has two vaulted cellars of different heights, and contains features which are suggestive of an earlier phase of construction, presumably slighted in the Wars of Independence. Built on the southern side, giving the tower the appearance of a tower house, is a square wing containing a spiral staircase dating to the 15th century which leads to the central range of buildings of the same date, but rebuilt in the 16th century, also the date of the courtyard wall. A final range to the south-east dates to the mid 17th century. Aberdour also has restored gardens with a 16th century plan and terraces. After a period of decline when parts were ruined and parts remained in use, it was handed over to the state in 1924. Today is is managed by Historic Scotland and open for a fee.